Hello! How are you all? I’ve flung myself into the Christmas holidays the best way I know how — by going out for food, and seeing everyone from home so that we can catch up. My week has basically consisted of eating, with the odd bit of Christmas shopping and writing thrown in for good measure. I’ve been so busy over the past term that I don’t want to put too much pressure on myself to get work done over the festive period — I’ll get off to a better start in the new year if I actually let myself have a break. 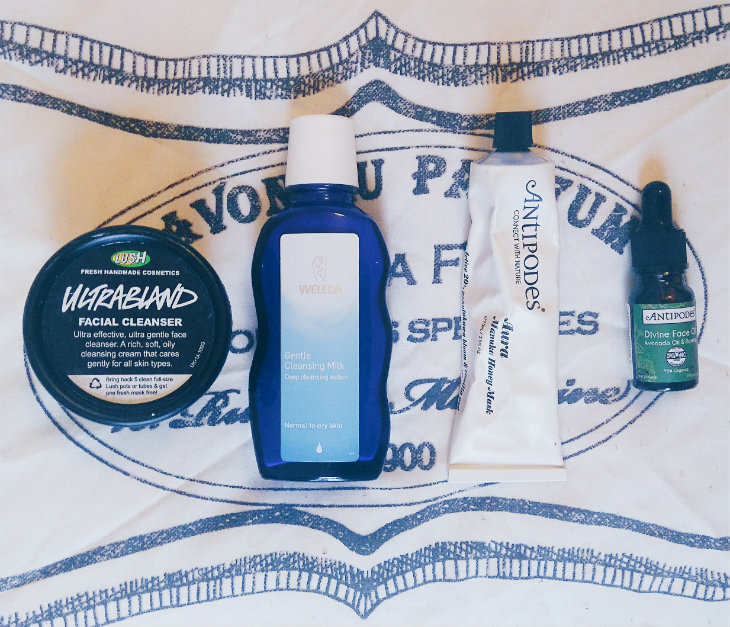 The topic for the #bbloggers chat a few weeks ago was ‘pamper nights’, and I soon discovered that I wasn’t the only one who doesn’t normally have the time for a full-on spa evening, as lovely as they are. But I do like to spend my Sunday evenings looking after my skin and painting my nails, when I can, so I guess that’s a pamper night of sorts? It’s just my normal skincare routine with a face mask thrown in, but it feels like I’m doing something for myself, and that’s enough to help me de-stress. I start by taking all my make-up off with the LUSH Ultrabland Cleanser, £7.50, which I suspect you’re all sick of hearing about by now (but seriously, it’s amazing). The thick balm melts into an oil and leaves no trace of make-up left — panda eyes are a thing of the past. I then follow with the Weleda Gentle Cleansing Milk (v), £8.94, which is a wonderful second cleanse, and is also ideal in the morning. The cleansing milk is incredibly kind to my spotty, sensitive skin and a little bit goes a long way. My favourite face mask at the moment is the Antipodes Aura Manuka Honey Mask, £20.69, which I’ve raved about on here a couple of times now. It feels like a light moisturiser, and all you have to do is smooth it on, leave it for fifteen minutes (it doesn’t set) and then rinse it off. My skin always feels so calm and hydrated afterwards. Finally, I finish with a face oil. I’m still in love with the Pai BioRegenerate Oil, and I’ve also been trying out the Antipodes Divine Face Oil Avocado and Rosehip, £17.99, which is equally lovely. Rosehip oil is supposed to be particularly good for blemished skin like mine, and my spots have been a lot less aggressive since I started using it. Now, on to nails. I so rarely have five minutes to sit and paint them, because I’m always doing something, so when I do get a moment it feels like a proper treat. I start with my toes because otherwise I end up smudging the polish on my hands (although tbh I usually smudge at least one nail regardless, so clumsy). I tend to use brighter colours because they make me happy when I look down and spot them. Right now I’m rocking Models Own HyperGel Polish in Purple Orchid, £4.99, which is bright but also a bit of a nod to the winter purple/berry trend I love so much. The colours I use on my fingers are usually a lot more muted, with red shades being the notable exception. At the moment I’m loving Barry M Gelly HiShine Nail Paint in Chilli, £3.99, which is a warm, brown-toned red, but I’ll wear any red, really: postbox, burgandy, glitter, you name it. How do you treat yourself? And what have you been up to in the run-up to Christmas? Let me know in the comments!